Manuka honey gel is a gel that consists of 100% Manuka honey. The gel supports the recovery of the wounded skin and can also be used in the wound. Manuka Honey gel is a gel that contains 100% New-Zealand Manuka honey without additives. The honey is filtered and sterile, making it suitable to use on wounds. Honey has beneficial effects on the recovery of the skin and helps protect from unwanted micro-organisms. Manuka honey gel is ideal for use on wounds, particularly ulcers, surgical wounds, burns and infected wounds, cavities and sinuses. Do not use this gel if your pet is allergic to bee venom. If your pet has diabetes, you should carefully monitor its glucose levels, even though the honey gel will not end up in the blood stream. Apply the gel generously to the wound. You can then cover the wound with a secondary bandage. Use the gel within 4 days of opening, and for one animal only. The gel can be used in combination with Algivon Manuka Alginate bandages to remove dead tissue. Store the tube at room temperature. When the gel becomes too hard, you can warm it up between your hands right before use. If the gel is too liquid, you can put it in the fridge for a couple of minutes. 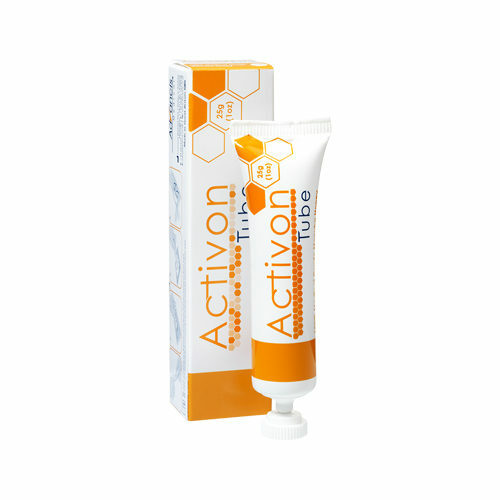 Have you used Activon Manuka Honey Gel before? Let us know what you think about this product. I was amazed how quickly this natural medication worked on the bite on my cat's leg. I checked it with my own vet first and found it to be recommended by them. The wound is now completely closed.